“Every marriage is a story with stories” – many stories, say authors Susan and William Rabior. Curious about what makes marriages work well, they interviewed apparently successful married couples. Seventy percent of the spouses were over age 55, most retired. In this book the Rabiors, he a psychotherapist and she an audiologist, share some of the stories they heard from older couples. The authors’ intention is to offer insights for other couples desiring to make the most of the “mature” stage of marriage. In an earlier book the Rabiors described ways to nurture marriage based on nine major factors contributing to marital success that they identified over the course of their interviews. 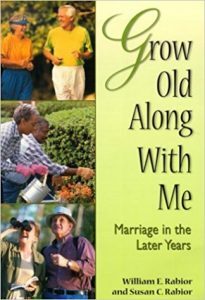 In this book they focus on additional factors for older couples, including suggestions for dealing with the particular challenges of aging bodies and an aging marriage. This book is easy to read and enjoy. Each of nine short chapters is comprised of real-couple stories illustrating the authors’ points, and each ends with questions to help married readers reflect and talk with one another. Some couples might be able to read and discuss a chapter a day, and almost everyone could handle a chapter per week. That would mean taking five to 10 minutes to separately read a chapter and committing 10 to 30 minutes for dialogue over a meal or while walking. Over the course of two months that’s a 15- to 40-minute weekly investment in one’s marriage — with infinite returns. This little book does not simplistically advise readers to trust God, sit back and expect all to be well. Its implicit message is to trust that God still has a purpose for your marriage after 30, 40, 50 and 60 years. The children may have come and gone multiple times, your hair has turned to silver if it hasn’t already fallen out, but you have attained some balance. There is another “half” of marriage with depths to plumb and pleasures to enjoy. Mary Ann Paulukonis finds this 43rd year of marriage with Jay to be among the best. They share artistic pursuits and speaking engagements, among other things, while she also offers consulting services for leadership and ministry.